Now that SQL Server vNext for Linux CTP1 is available, you want jump in and test you installing existing databases. You may want to use databases with compatibility to SQL Server 2012 and greater. 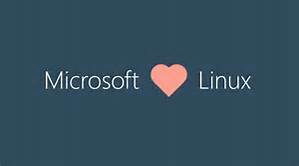 As I’m not a full Linux Admin but this opportunity to setup and use SQL Server on Linux definitely has help stepup to learn about Linux OS. 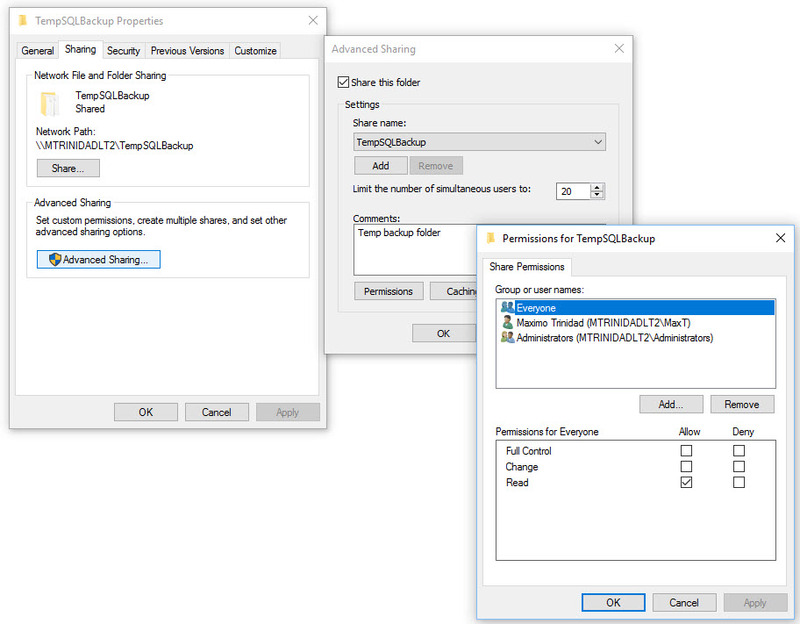 So, before you start working or trying to restore your Windows SQL Databases to SQL Server on Linux, there are a few things you may need to do. This will involved installing components which are not installed by default when first build your Linux System. One thing I had to say with confidence! You WILL find all your answer on the internet. 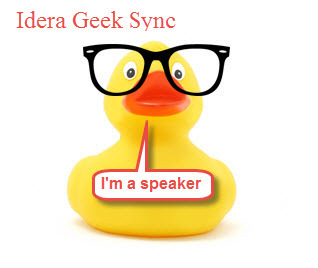 Any of the Linux Distro forum have your resolution to any of the issue you may encountered. Also, most of the time you Linux system will tell you (or gives a tip) what do with missing dependencies. Other than that, there are Linux Application Updater solution to help keep your system up-to-date. 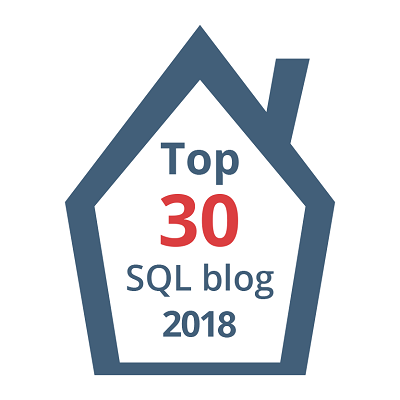 1. understand your SQL Server database Linux path – as you may know this is totally different than you Windows database location. In Linux, your databases will be preferably stored at ‘var/opt/mssql/data‘ which ti will be seem on SSMS as ‘C:\data’ folder and this may change on later builds. 2. Create a Windows Shared folder – This one is easy to do using the Windows Explorer. But, you will need to play with assigning permission. To speed up the processes (for testing) use “Everyone” with Read-Only. Now, we can successfully restore a database from a Windows Shared folder. No need to FTP your Windows backup to Linux FTP site. 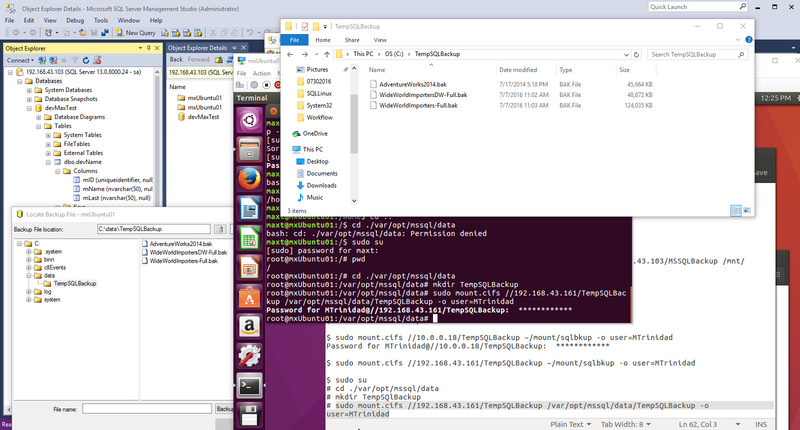 From your Windows client, Using PowerShell to restore your Windows Database Backup to Linux. 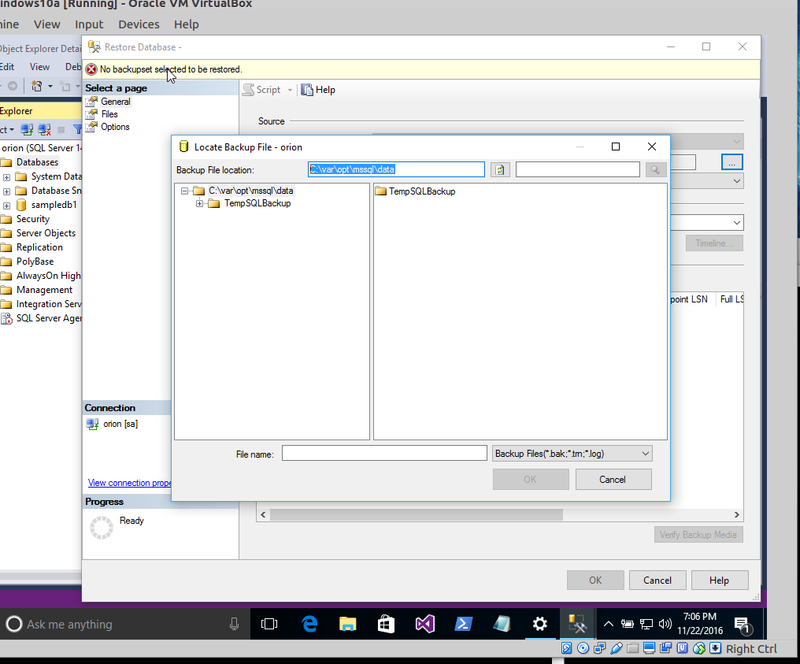 Using the SQL PowerShell cmdlet “Restore-SQLDatabase” available when installing SQL Server Management Studio. 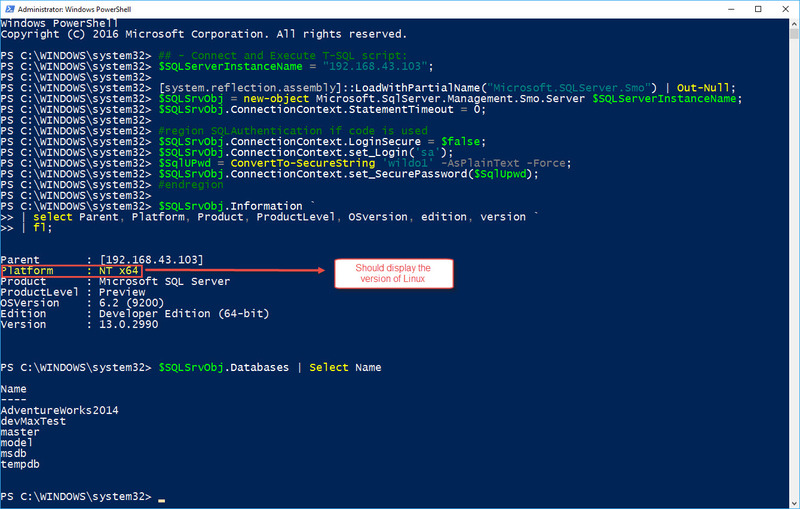 Keep in mind, for now you can manage your “SQL Server vNext for Linux” (up to some extend) using either the existing SQL PowerShell cmdlets or buidling your own PowerShell scripts with SMO. In above sample, although I have connected to a SQL Server Linux engine, the platform still showing as “NT x64”. This issue has been addressed and will be corrected soon. So, try running your Windows PowerShell scripts against your SQL Server Linux systems. SQL Server vNext for Linux CTP1 is available now.